From the moment he won his first ever race and became the youngest race winner in Supercars back in 2013, Scott McLaughlin had been destined for greatness in Australian touring cars. Now in 2018, he has been crowned Supercars champion. Settling for second in the final race of the season in Newcastle, the 25-year old had the points he needed to claim his maiden championship from what has been an intense season-long battle with compatriot Shane van Gisbergen. The nine race wins and 12 pole positions barely paints the picture for the almighty 2018 campaign that McLaughlin has had, with his approach to racing his rivals the most crucial aspect to his success this year. Following the heartbreak of snatching defeat from the jaws of victory on the very same streets on which he celebrates success this time, McLaughlin’s newfound maturity and composure has been a testament of his talent this year – all to ensure that a repeat of 2017 wasn’t on the cards. It was the days on which he and his DJR Team Penske could not win, that the young Kiwi capitalised, with the eye on the ultimate prize firmly in mind. Accumulating those points and ensuring there were no DNFs is what holistically stands out more than the victories. Having led the championship since Phillip Island’s Race 9 right through till Race 23 at Tailem Bend, it wasn’t until the latter event that there was a genuine fright and the a surprising lack of pace from Ford Falcon FG X. Van Gisbergen and his Red Bull Holden Racing Team came online to capitalise at the right time, having dominated from the Sydney SuperNight through to the Sandown 500 – but it was the mystical Mountain which changed the face of the championship again. In his sixth attempt, McLaughlin was finally able to grace the Bathurst 1000 podium and it was a crucial third place in the bank, on the day his rivals all could not convert – was the defining moment, showing Scott’s transformation post-Newcastle 2017. McLaughlin’s long-time trusty co-driver in Alex Prémat certainly put in those key drives too, during the Enduro Cup and staying out of trouble, whilst Van Gisbergen was penalised on the Gold Coast for an unsafe release and as a result lost the championship lead. Auckland was defining too, with both McLaughlin and Van Gisbergen squaring off and claiming a win apiece on home soil. It was also the first time really that there was some sparks in the rivalry, with the whole ‘doorgate’ scenario unfolding in parc ferme. Staying away from controversy however, was another hallmark of this championship year for McLaughlin and all the drama not fazing the Ford driver, while there was more controversy for Van Gisbergen and his pit-lane wheelspin at Pukekohe. 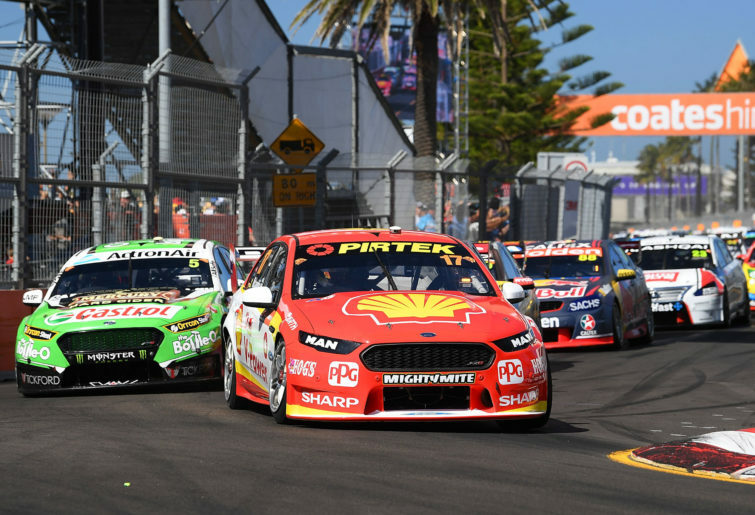 Even at the Newcastle 500 finale, McLaughlin kept his focus away from the fuel hose drama which led to Van Gisbergen getting his Race 30 win stripped and handed to his Shell V-Power Racing rival. Many will debate the fairness of that penalty to the Red Bull driver and what had the outcome have been if instead of a 53-point lead going into Sunday, there was a 2-point lead if Van Gisbergen kept that win. However, that’s all in hindsight and in the end, McLaughlin was still the better driver all year round. Significant too is that Ford get to farewell the Falcon as a championship winning car, given that it’ll be replaced by the Mustang in 2019. It’s also the 17th title won by a Falcon chassis and quite poignantly too by the car adorning the famous number 17. All the hard work done by DJR Team Penske has been rewarded and for the Penske organisation it has been a stellar year of success, with the NASCAR championship going to Joey Logano, the Indy 500 being won by Will Power and the Penske name itself achieving its 500th win worldwide. And above all, since his debut for Garry Rogers Motorsport in 2013, McLaughlin has always been earmarked as the successor to the great Craig Lowndes as Supercars’ people’s champion and it is only fitting that on the weekend the veteran bows out of full-time racing – that the young Kiwi is fully anointed. From plucking into first and giving it some jandal in his Volvo S60 against Jamie Whincup in Adelaide back in 2014, to now raising the championship trophy on the streets of Newcastle for the first time – McLaughlin has come a long way in his short career and there is yet plenty of years ahead to look forward to.